Here are the screens from the past two Galaxy S phones. It’s time for a change. 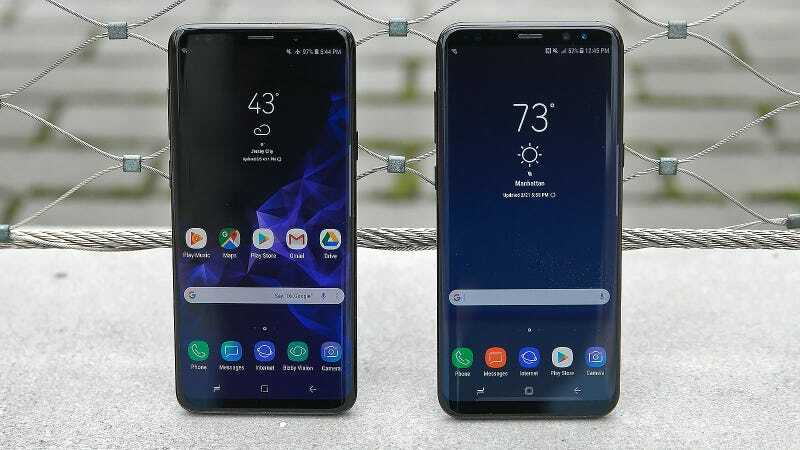 Samsung is one of the clear leaders in mobile display tech, and its screens are found in a wide range of flagship devices including its own Galaxy phones and those of its biggest competitors like Apple. However, one of the biggest complaints about the Galaxy S9 is that looks virtually identical to last year’s device, a sentiment that arose largely due to the fact that Samsung didn’t do much to change up the S9's screen. However, based on a number of leaks and rumors, that may not be an issue for Samsung’s next big phone, which could boast one of the most advanced mobile displays yet. According to noted tech leaker @Ice Universe, during Samsung’s 2018 OLED Forum, the tech giant presented a slide about integrated screen sensor tech that detailed four major innovations: a fingerprint sensor built into the display (FoD), a speaker that’s built-in the screen (sound on display), vibrations that emanate from screen (haptics on display), and what might be the most tantalizing feature, UPS, or an under panel sensor. That last one is a biggie, because if it works, it would allow Samsung to install things like a selfie camera or iris scanners beneath the actual display, which would eradicate the need for a bezel. And when a phone used those sensors to take a picture or unlock the device, it would only need to turn off the pixels above each sensor for the component to function normally. If Samsung is able to perfect all these features and cram them into a single display, that would pave the way for an all-screen phone that wouldn’t require the pop up camera housings that we’ve seen on devices like the Oppo Find X and Vivo Nex. Additionally, Ice Universe isn’t the only one claiming that Samsung is working on under panel sensors, with Samsung Mobile News’ tweet adding more credence to the possibility of fancy new Samsung screens coming soon. However, there’s no guarantee any of this actually makes it on the Galaxy S10. In previous years, there were widespread rumors that Samsung was toying around with in-screen fingerprint readers. However, as of yet, none of Samsung’s phone have actually delivered that kind of tech to consumers. That said, with the Galaxy S line due for a major design refresh after two years of using the Galaxy S8's template, there’s at least a little hope Samsung’s ambitious tech could become reality.